What is this? It’s an image copy of a 2GB SDCard with bootable CM10.1 Android 4.2.2 Jellybean. 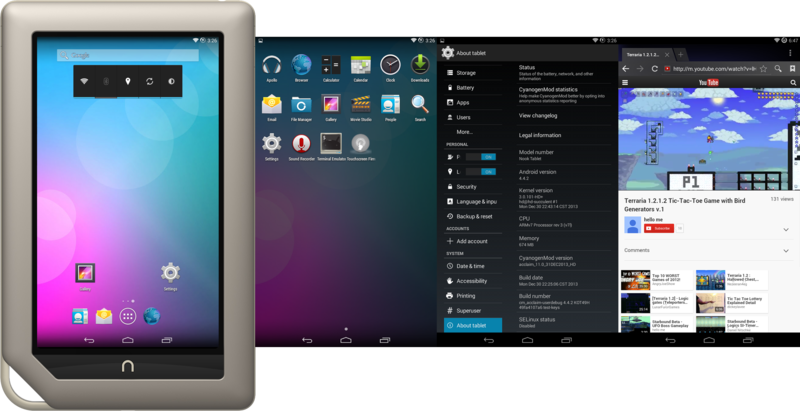 You simply burn the image to your 2GB SDCard or bigger and you have a bootable CM10.1 with GAPPS running on your Nook Tablet. Nothing alters to your Nook Tablet internal system. There will be bugs. Use Google or Bing for faster answers if you have problems before commenting. Make sure you have more than 2GB of space available on your computer. You need to install 7-Zip 9.30 to extract the file. 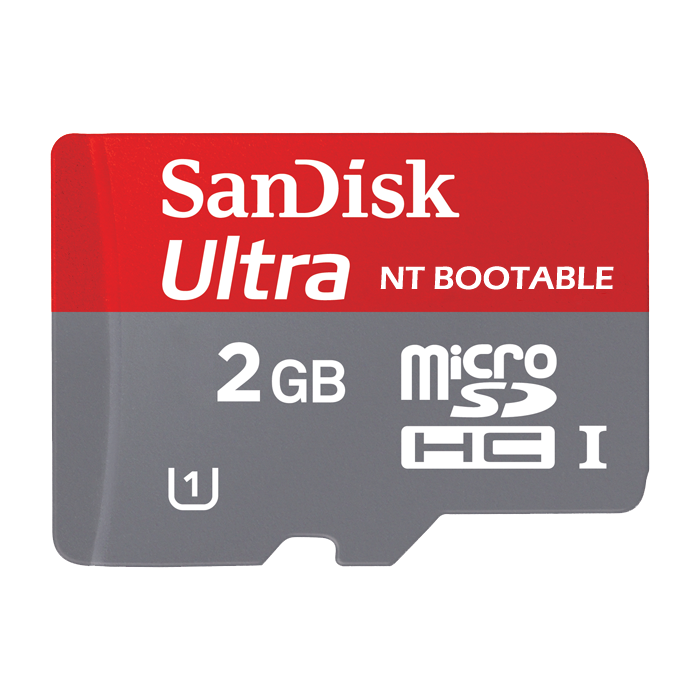 This is a 2GB image that can be burn (instructions are below) to a 2GB or larger microSD card. After installation, DATA1 (partition 3) and SDCARD (partition 4) has XXXMB. You want to expand DATA1 and SDCARD partition size if your card is larger than 2GB. Download and copy flashable_expand_bootable_sdcard.zip onto your (BOOT) SDCard. It’s a file you install to expand the DATA1 and SDCARD partition size based on your SDCard size. 3GB for 16GB card, 2GB for 8GB card, 1GB for 4GB card, and 600MB for 2GB card. The space left is dedicated to the SDCARD partition. Hold the power button for a couple of seconds to turn on device. Boot into Cyanoboot’s ‘Boot Menu’ by holding the home key. Power off device and turn device back on. Boot into Cyanoboot’s ‘Boot Menu’ and select ‘SDC Boot’ to boot into CM10.1. There are many great ROMs out there, with the more popular ones being AOSPA (ParanoidAndroid), CM10.1, and AOKP. Being all great ROMs, it is sometimes difficult to choose which one you want to run. Why choose when you can have all three? P.A.C.-Man ROM is combination of all three ROMs, so you don’t need to keep switching or deciding between which one to flash. 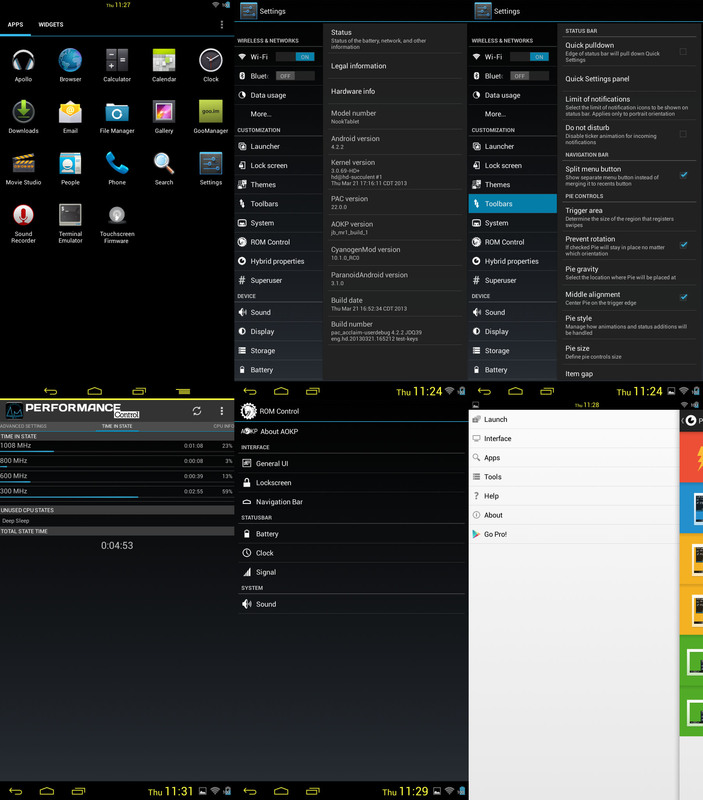 Get all of the features in one ROM! Look at PAC source history for further changes, I will not post them. 03/22 – Repo synced, Initial build so there could be many bugs. 03/29 – Repo synced, kernel updated to 3.0.71, fixed: calendar crashing in portrait mode, boot animation, high battery drainage in deep sleep, some heat issues when device is in high load (maxed frequency) for long period, removed phone and phablet ui from Hybrid Properties (Default Tablet UI) , default boot orientation is landscape (Don’t ask why). 04/10 – Repo synced, kernel updated to 3.0.72, NO MORE DEEP SLEEP (deep sleep does not help reduce battery drainage when device sleep but causes problems with our current kernel), improved battery drainage in sleep, the device will wake and get charged when you plugged in power cable, changed default governor to Wheatley for lower battery usage, added back 1.2GHz, removed faked battery data (you will need to do a full charge, green light, to get accurate battery stats), used Wi-Fi codes from BN, Wi-Fi is set to turn off when the device sleep, added back default dual-pane preferences, latest CWM 6.0.3.0 recovery, make use of sdcard0 (EMMC) as default storage for those without SDCard, added back Phablet UI to Hybrid properties (Navigation bar buttons and Battery bar options only work in Phablet UI currently). GooManager: Rom ending in *SDC is for SDCARD boot, don’t get it mixed up with internal rom. It’s a flashable file (a file that you can install from recovery) that will create a bootable SDCard for your Nook Tablet. What it does is creates 4 partitions on your SDCard. Size for partition 3 (DATA1) and partition 4 (SDCARD) vary. It’ll also copy over boot files to your SDCard, making the SDCard bootable on your Nook Tablet. This will only work with the provided CWM 6.0.2.9 because it contains fdisk with advanced options. Format your SDCard with SDFormatter if you are on Windows and OSX. Linux? GParted. Copy CWM 6.0.2.9 recovery (renamed the internal recovery img to recovery.img) to your SDCard. Copy flashable_create_bootable_sdcard.zip to your internal storage. # If you are still on Stock Rom, you need to be rooted and have terminal installed. # Store the stock_recovery.img on your computer for future need. # Boot to recovery. Power up device by holding Power + Home keys. # If you already have previous CWM version of recovery installed, just flash the new one. Make sure the USB cable is not plugged into your computer. Ignored the “can’t unmount /dev/block/mmcblk1p1”. Be patient with the loading bar. It’s not frozen, just wait. The larger the DATA1 size, the longer the process take. Power off device and turn it on again. If successful, it will boot into Cyanoboot. Then you can install *SDC Rom. The default data1 (Partition 3) size is 600MB in flashable_create_bootable_sdcard.zip. To make data1 size larger, just rename the file ‘createsd_*.sh’ to ‘createsd.sh’ inside flashable_create_bootable_sdcard.zip. Complete scripts with 4000MB/5000MB DATA1 size. 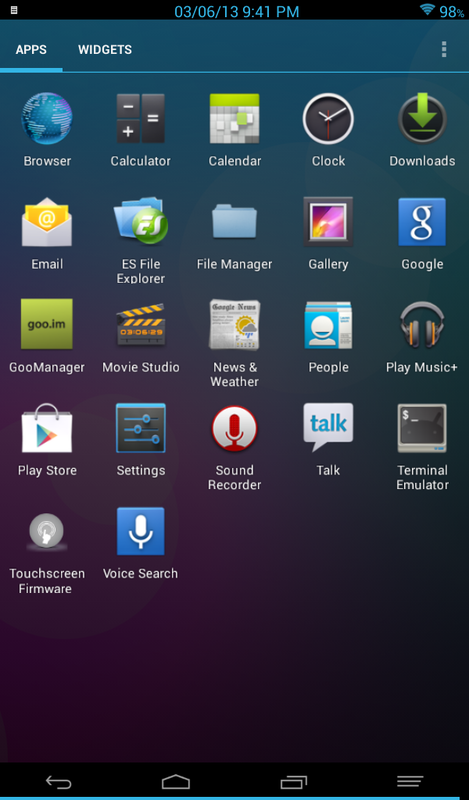 If you are using SD bootable CM10, you need to edit vold.fstab in /system/etc. Under SDCard – auto, changed ‘auto’ it to ’4′ using CM FileManager with root access & write access. Where’s Developer options & Performance? Click Build number 7 times. Easter egg? Click Memory or Android version several times. 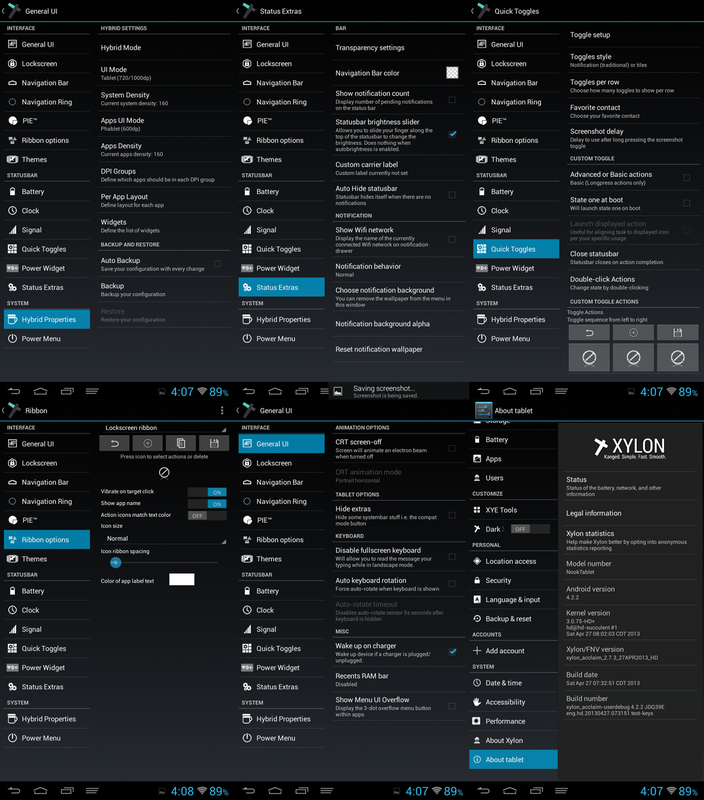 02/18 – Repo synced, kernel updated to 3.0.65, android 4.2.2. 02/21 – Repo synced, kernel updated to 3.0.66, larger clock and battery font. 02/26 – Repo synced, kernel updated, removed 1.2GHz because device can get really hot because NT doesn’t have a temp sensor and I am tired of hearing about battery life. 03/08 – Repo synced, kernel updated to 3.0.68 with new lowmemorykiller, font size increased a little in statusbar and Trebuchet, you can increase icon size to 120% in Trebuchet, gesture control in Trebuchet, new SuperUser (Koush’s). 03/17 – Repo synced, kernel updated to 3.0.69, scaled tablet status bar icons, revert battery profile, cwm recovery 6.0.2.9 with advanced fdisk, sgdisk, gdisk, gentable, and parted. 03/30 – Repo synced, kernel updated to 3.0.71, fixed boot animation, default boot orientation is landscape (Don’t ask why). 04/09 – Repo synced, kernel updated to 3.0.72, NO MORE DEEP SLEEP (deep sleep does not help reduce battery drainage when device sleep but causes problems with our current kernel), improved battery drainage in sleep, the device will wake and get charged when you plugged in power cable, changed default governor to Wheatley for lower battery usage, added back 1.2GHz, removed faked battery data (you will need to do a full charge, green light, to get accurate battery stats), used Wi-Fi codes from BN, Wi-Fi is set to turn off when the device sleep, added back default dual-pane preferences, latest CWM 6.0.3.0 recovery, make use of sdcard0 (emmc) as default storage for those without SDCard. 04/21 – Repo synced, kernel updated to 3.0.74, changed default governor back to Interactive due to device with stock OS booting into black screen, revert back to having downloaded app data stored in sdcard1 (external_storage), you can flash Flash_INT_Boot_EMMC_21APR2013.zip if you want your downloaded app data to be stored in sdcard0 (internal_storage). 05/02 – Repo synced, kernel updated to 3.0.76, changed home screen clock. 05/31 – Repo synced cm10.1-RC3 (Release candidate), kernel updated to 3.0.80. When you turned on Wi-Fi, you will get a CM Update notification (You can turn it off manually). DO NOT UPDATE. The update is for the Official CM build for acclaim that only works INTERNALLY. It does not have all the features based on SGT7. 06/29 – Repo synced cm10.1.0, kernel updated to 3.0.81. 07/07 – Repo synced cm-10.1.1, updated MT, updated PVR files, CWM v6.0.3.3, use really long write timeout to deal with crappy cards. You need to do a full wipe if you are coming from an older android version. FULL WIPE: Factory reset for internal boot and clear data1 and cache for SDCard boot. DIRTY INSTALLATION: Clear cache and dalvik cache. For best battery life, use Wheatley governor at 800MHz and manually turn on/off Wi-Fi overnight. Use Titanium Backup to back up your apps and data. Settings stopped when backing out of System/Quick settings panel/Tiles and layout in Tablet UI mode. Make a script for auto card resizing of DATA1 and SDCard partitions for SDC boot user. Larger font text size is coming. 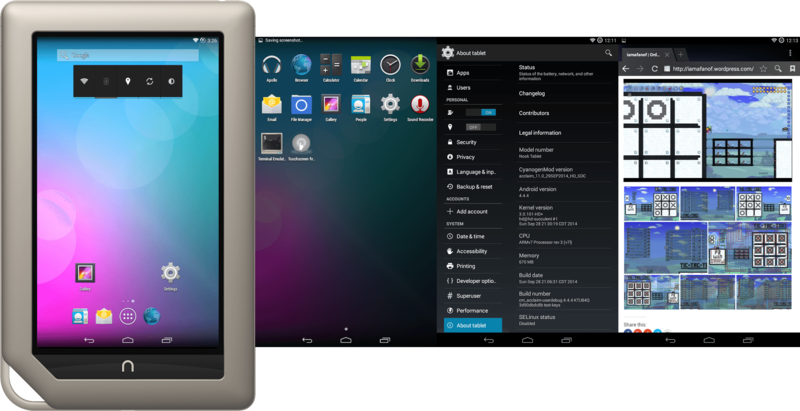 This is a test build of ParanoidAndroid AOSPA 3.+ for Nook Tablet. I just compiled it from source for fun. The main thing you’ll notice is the addition of Pie, a customizable softkeys/statusbar. You’ll unlock “Developer options” by tapping “Build number” 7 times. There is no “Performance” settings, so you’ll have to use set CPU app or init script for CPU settings. The default CPU settings is 1008MHz max and Interactive governor. What I added are CMFileManager, Sound Recorder, and Terminal Emulator. AOSP is bare bone Android. If you are used to CM settings, you’ll find there are missing settings here. What’s not working? You tell me. PA sources are still rolling out. Serial Number is unknown, I can’t resolve it. If you’d like to help the Paranoid Android team, you can buy their Paranoid Android Preferences app on Google Play. Clear Data/Factory reset and Dalvik Cache before flashing if you are on CM build. Booting can take several minutes so be patient. Can’t take screenshot in newer build due to SurfaceFlinger. No battery percentage implemented yet. 02/23 – Repo synced, kernel updated to 3.0.66, compiled with GCC 4.7, look at the PA source history for further changes. 02/26 – Repo synced, 3.10, removed Trebuchet due to some issues, fixed rotation problem, fixed screenshot problem.